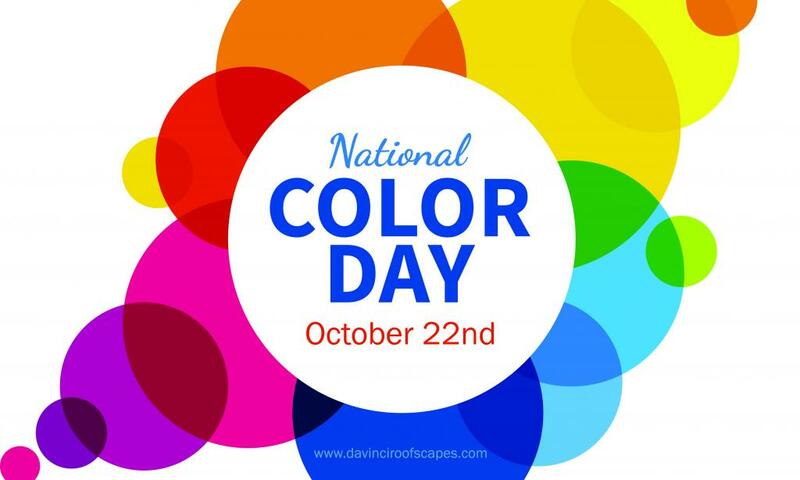 Today Is National Color Day! DaVinci Roofscapes is all about COLOR. From their color studio to the 50 colors in unlimited combinations they offer and all of the color insights and advice they have allowed me to share as their color expert over the years their appreciation for color shows. National Color Day is also all about COLOR. October 22nd is a day set aside for celebrating the color-filled world we live in. It is also a day to learn how colors influence our mood, productivity and behavior in our everyday lives. So rather than talk about how to choose color for your roof or other elements of your home exterior I wanted to give you a glimpse into the meanings that colors convey. The psychology and symbolism of each color has a profound impact on the choices you make consciously, unconsciously and subconsciously. Below is a quick look at some of the most common associations for each color. Yellow shines with optimism, enlightenment, happiness and carries the promise of a positive future. Yellow can instill optimism and energy, as well as spark creative thoughts. Orange sparks more controversy than any other hue and true orange elicits a stronger “love it” or “hate it” reaction. Fun and flamboyant orange radiates warmth and energy. Red is inherently exciting and the amount of red is directly related to the level of energy perceived. Red draws attention, and a keen use of red as an accent can immediately focus attention. Pink combines the passion of red with the purity of white. Bright pink has the same high energy as red; softer pinks are associated with romance, sweetness, and a desire for the more carefree days of childhood. Purple embodies the balance of red’s stimulation and blue’s calm. With a sense of mystic and royal qualities, purple is a color often well-liked by very creative types. Blue is the overwhelming “favorite color.” Blue is seen as trustworthy, dependable, and committed. The color of ocean and sky, blue is perceived as a constant in our lives. Green is the pervasive color in the natural world and we are so used to seeing it everywhere. The natural greens, from forest to lime, green is tranquil and refreshing. Green is the color of peace and ecology. Gray is the color of intellect, knowledge, and wisdom. It is perceived as long-lasting, classic, and often as sleek or refined. It is a color that is dignified, conservative, and carries authority. Black is authoritative and powerful; because black can evoke strong emotions, too much can be overwhelming. Black represents a lack of color but also is associated with prestige, high quality and sophistication. White projects purity, cleanliness, and neutrality. Doctors don white coats, brides traditionally wear white gowns, and a white picket fence surrounds a safe and happy home. I hope you enjoyed this short color break. If you want to learn even more about color psychology, symbolism and meaning I invite you to visit my website SensationalColor.com. Now back to our regularly scheduled blog post about color for your home.